PHLUR began as a way to create sustainable, stunning fragrances that transform everyday moments into memories. Based in Austin, Texas and founded in 2015, it was designed with select perfumers, and their product were created without the typical constraint of time, cost and creativity. PHLUR is reimagining fragrance. They are very proud of this. The founders of PHLUR have worked closely with their partners to ensure their products and processes are as ecological and deliberate as possible. With an immersive digital experience, each scent is explored through visual narratives that represent the inspiration and feeling of the fragrance. Their supplies are committed to supporting the communities that make their products possible, and for every bottle sold, they donate $5 to to support sustainable initiatives. Fragrance should be enjoyed. Not in a mall. Not on a strip of paper. But on a person. Like yourself. At your pace and in your place. Their line was developed to meld with your and evolve on your. Because they know you are more complex than a strip of paper. Since the line was specifically designed for skin and not strips of paper, PHLUR has introduce a novel sampling process that lets customer audition the scent in their real lives, the way it should be. Olmsted & Vaux is bright, crisp and ultimately clean. It revitalizes with every wear. Its perfumer was Nathalie Benareau. Olmsted & Vaux was inspired by a rejuvenating morning walk through Central Park, and named for the park's architects. It was also inspired by the following: someone who is polished and sophisticated, a classic structure refreshed, thought and presence aligned and quietly modern aggressive. 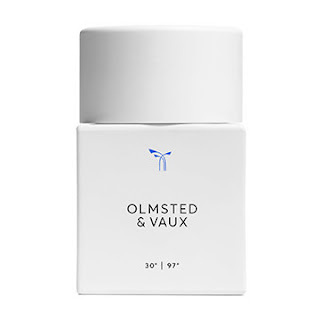 Olmsted & Vaux is a citrusy burst, known to inspire confidence and composure. A crucial last layer for, say, a big meeting with the board or encountering any alluring strangers on your way to the office, PHLUR believes there is no wrong way to smell a fragrance, even experts sometimes cannot identify what is in a particular scent. That said, if you are craving notes then are are they to stand in your way? Which brings us to the notes for Olmsted & Vaux: shiso leaf, white ginger and maté. For every bottle of Olmsted & Vaux purchased, PHLUR will donate $5 to the Central Park Conservancy, a non-profit organization that works tirelessly to preserve and protect the park. This way the park that inspired them can inspire other for generations to come. For $10 PHLUR has sample sets available for you to try out. This lets you try out fragrances on your own skin, in your own space before purchasing the larger bottles. I would highly recommend trying these out first if you are not sure of the kinds of fragrances you like. Each fragrance also has its own playlist on Spotify. These playlists describe the mood of each fragrance. I absolutely adore Olmsted & Vaux. To me it is very sensual and one of the best scents I have ever owned. It starts out citrusy and then leads into a possible amber middle note with a musky and heavy woodsy heart note. But its not that strong, which is why I like it so much. I have other fragrances that are similar to this that are so strong. This one is not. It is almost pure perfection. I am looking forward to trying out the other fragrances in their collection. Thee are five others: Hanami, Moab, Greylocke, Hepcat and Siano. Hanami is described as an aquatic floral tableau, with a reverent subtlety and a warm embrace. Moab has its arid spice seducing the vastness of the west, emanating an invigorating dry heat. Greylocke is refreshing and restorative, and expression of nature and New England heritage. Hepcat is described as coarse and fearless meets smoky and raw. Siano is a pure expression of elation, as enchanting as it is powerful.